We design, manufacture, and install steel framed general-purpose buildings, from animal housing for cattle, poultry and livestock. 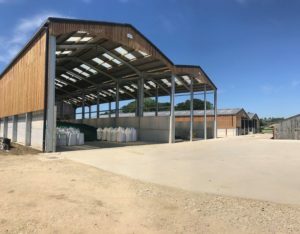 We also design, manufacture and erect milking parlours, large crop and grain stores, barns, and bunkers. 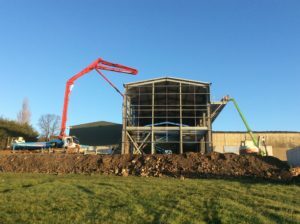 We can also complete ground works and additional concreting works, install a range of slurry stores, silos, tanks and concrete panels to your requirements. We design and manufacture all of our steel framed buildings in-house. This ensures we can tailor make our buildings to suit your needs. We supply industrial buildings, from warehousing, retail units, workshops, manufacturing facilities and commercial buildings. 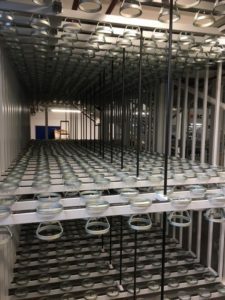 We also design, manufacture and erect internal mezzanines, storage systems and facilities. We can also complete ground works and additional concreting work. We install a wide range of concrete shuttering, holding tanks, concrete floors and concrete panels. We design and manufacture all of our steel framed buildings in-house. This ensures we can tailor make our buildings to meet your specification. We can prepare your site ready for your next project. We undertake groundworks all across the UK. Contact us to arrange a FREE consultation & quotation!